Who would you be if you had fewer negative thoughts? If you could move through your fears? If you could pursue your dreams with honesty and integrity, without caring what others might think? Who would you be if you spent less time worrying? What could you achieve? Would your life be different? What would your relationships look like? More and more women are beginning to step into their own power. They want meaning and fulfilment in all areas of their lives. They want to pursue dreams that may have been abandoned for a myriad of reasons. This is a book for women who want answers. Women who want to take action. Women who are ready to embrace their authentic selves. The book is accompanied by a series of guided meditations which I have recorded to assist you with your journey. Meditation is a powerful tool and will really help to seed the work that you are doing throughout the book. This 7 track meditation album (Download €9.99 or Double CD €12.99) is designed to assist you in experiencing subtle shifts for radical change as you reclaim your life, becoming happier, more fulfilled, stress free and authentically you! This book is all about a journey to self -compassion through mandala colouring by becoming aware of our inner voice, that yak yak yak monkey who keeps on talking....you know the one! When you engage with mandala, the voice seems a little more coherent, we can become more readily aware of it. When colouring the pieces, the idea is to bring awareness of how you are speaking to yourself. Are you being kind? Would you say this out loud to a friend or a stranger? Are you comparing your work to that of someone else? Are you worried about time? Are you worried about running out of a certain colour? (lack) And if you do run out, how do you react? It is fascinating to bring awareness to these elements of ourselves. In doing so, we shine the light on them and it is only then that we can truly heal. The way we interact with the mandala will mirror how we are in the bigger issues of life. Each mandala is accompanied by an inspirational quotation from great thinkers both living and passed. There are also three journalng pages per mandala in which you can record your thoughts and reactions as you progress. You can use the book as an aid to self-development or indeed to document a journey. There are forty mandalas, and it came to my mind that there are forty weeks in a pregnancy. What a wonderful way this would be to record these weeks, connect with your baby in an utterly peaceful way. What a keepsake! Or if you are traveling be it physically or emotionally. It was during my divorce that I came to do mandalas and the peace and fulfillment that they have given me cannot be understated. The book also contains ten coloured plates of my work on black which you may be more familiar with. With each plate, there is a short meditation for you to engage with. Take the journey. It is worthwhile getting to know yourself. You can take the journey alone. Or you could journey with a group. This would also be a very interesting exercise. Have your friends around, put on some beautiful music, light candles and work in silence. Afterwards discuss what took place as openly as you can. Enjoy an 8 minute guided meditation for deep healing. This is something that you can do each day. It is a great way to begin or end the day, or indeed both. You know the old adage...if you don't have time to meditate, then meditate twice as long! There are many more longer meditations which you can access on my YouTube channel. 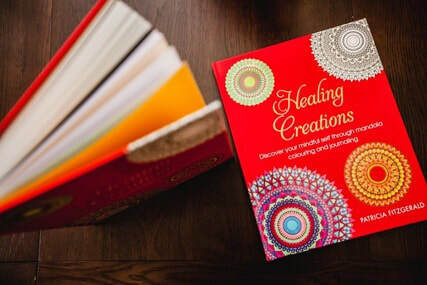 These meditations will take you on a creative uplifting journey of light and peace inside of one of my intuitively created mandalas.